Do we have a winner for the NSW #6 yet? Scouting Reports are a regular feature on www.wdnicolson.com and they generally appear at State of Origin time. It also features Full Votes from Round 10 of The @NRLTweet Player of the Year Awards. 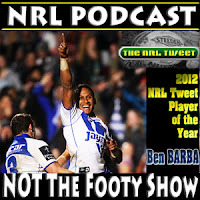 Let us know what you think of each grade via @NRLTweet or please email us. NSW coach Laurie Daley has already picked most of his Game 1 team (we know that because he told us about the NSW Squad weeks ago) but he also indicated that he was likely to settle on his remaining squad by the end of Round 10. So www.wdnicolson.com studied the performances of Origin hopefuls this weekend and here's how we rate the chances of the various NSW and QLD contenders with one round left before Game 1 teams are named. Our QLD Squad Analysis is here. Did himself no favours by backing up a quality Round 9 performance with a mistake ridden and switched off game against the Sharks. And why oh why is he kicking goals David Furner? Didn't play himself out of consideration but he didn't enhance his chances. Scored the first try by standing up Marika Koroibete easily, but despite South Sydney ripping the Tigers apart - he didn't really feature in the game thereafter. Daley knows what he'll get from Merritt though - so Friday's non-eventful performance essentially had no bearing on his NSW chances. Calf tear has likely ended his bid to replace Brett Stewart in the Game 1 squad... not that it would have been at fullback but calf tears this close to June 5 do not heal in time. Will miss out, which is a shame because he is the all-rounder NSW would love to have in the backline. Ankle injury hit him at the wrong time... quiet for two weeks and then finally had a week off to rest it. In those three weeks his main roadblocks to a NSW recall got injured... extremely unlikely now. Can certainly run the ball but I can't see him being picked until he addresses his deficiencies defending the bomb/cross kick. However Daley still has to make up his mind so... anyone could be in the mix for this position now. Update: Was okay against melbourne, but didn't see any quality ball in attack - all his work was of the grunt variety. Didn't say 'pick me', but didn't get a chance to. Hasn't scored a try this season but his game on the defensive side of the ball had been good up until the last fortnight. Hasn't looked like a rep player recently... probably safe in Daley's team but his form hasn't been good at all. Mind you, actually getting some decent ball would help. Has probably out-pointed his main rival (Maloney) in the last fortnight but he has started from behind the Rooster on the pecking order after a foot injury kept him out a few weeks back. NSW don't have a better ball-player to pick... and truth be told if I had a say - he'd be my halfback ahead of Mitchell Pearce. But I don't and Pearce is THE HALFBACK PEOPLE! Is still in front of Carney based on the winning ways of the Roosters while he plays alongside Pearce. 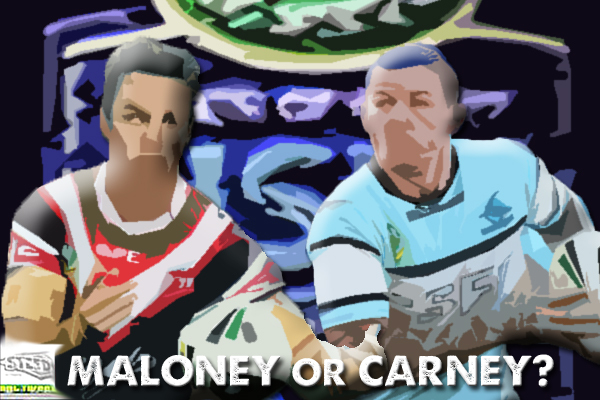 Carney has more natural ball playing ability but Maloney is a hole runner and has a tenacity that screams 'Origin ready'. Plus he's a better goalkicker than Carney... My gut feel is he's still the favourite. Worst game of the year on Friday night but he wasn't alone as a Tiger. Is built for Origin given his ability to play the game at a high speed and I still think Daley will look to team him with Robbie Farah in the middle of the field from kick-off. Poor start to 2013 but he's doing everything he can in the last three weeks to get his spot back. Lacks the mobility of Woods and Andrew Fifita... which means he won't play more than 15-20 minutes if picked. I'd be more confident of his chances if Ricky Stuart was still coach... I think he's going to miss out. Is playing out of his skin right now - defending well and running the ball hard and most importantly - often. If Daley wants to really roll the dice and give QLD a fright off the bench - Fifita is the pick. However I think he'll miss out to Ryan Hoffman. Yep Ryan Hoffman. Yet to play in Round 10. Has Phil Gould's seal of approval... I think Daley will listen, even if he's much more suited to starting than playing off the bench. Good player, but won't offer the impact a prop will if picked on the bench. Update: Tries hard but isn't a game changer... driven back a lot by the Manly forwards but did run some good lines late in the game. Under pressure from the extra props... didn't ease that pressure tonight. J Hayne, N Merritt/B Ferguson, M Jennings, J Morris, B Morris/Merritt/Ferguson, J Maloney, M Pearce, A Woods/T Grant, R Farah, J Tamou, G Bird, L Lewis, P Gallen (c). Bench: K Gidley, T Merrin, A Watmough, R Hoffman. Our full NSW Squad Analysis is here. I think with Taylor imploding - Te'o is safely on the bench alongside Gillett. Can play middle if he has to, but he's been doing a good job for the Rabbitohs this year as an edge backrower. Might only play 10-15 minutes for Queensland but hard to see him not picked. Form is good enough right now. Lost the plot - not for the first time this season - against the Broncos and doesn't appear to value his place in first grade right now, let alone the Queensland lineup. QLD Selectors would be going beyond loyalty picking him right now... his form and focus doesn't warrant it. Update: Faces a suspension for a high tackle... no Origin 1 appearance for DT boys and girls. Tried hard against Cronulla but his team losing probably pushed his name out of the lights... as a New South Welshman he's the one bench option I do NOT want to see QLD pick... Sam Thaiday or Nate Myles would need to join the prop rotation after their first stint if Papalii is going to be useful off the bench. Don't think he's a strong chance as long as both Ben Te'o and Matt Gillett are picked on the bench. I watched Penrith annihilate the Warriors on Saturday night and didn't notice Lillyman... at all. Now that might not be a bad thing for Lillyman actually... but he needs a massive Round 11 to remind the QLD selectors of how he 'did the job' in his other Origin stints. Good chance of a call-up based on been there done that factor. Might be a roughie but he played well for the Roosters up front in the absence of Sam Moa and Jared Waerea-Hargreaves against Matt Scott and James Tamou. If QLD decide to go with an extra prop - he's the smokey. If any of the key QLDers are carrying an injury into Origin camp - DCE is the perfect 18th man, as he can be inserted in either starting half spot or on the bench as cover. A big performance against Melbourne pushes his claims deluxe if QLD decide to pick both him and Gillett as utilities on the bench. Update: Very good in the MNF draw and his 40/20 kick was as good as it gets... but when Manly finally got the ball in the second half - DCE couldn't create that half chance to get Manly across the line. Remains very much in the discussion for a bench spot if QLD want a second utility next to Gillett. Yes he can play out wide but QLD might as well pick a genuine outside back on the bench instead of McQueen because Gillett and Te'o can do that 'centre fill-in job' just as easily. He's solid but with respect he's not an Origin player is he? If Hodges is in any real doubt for Game 1 - Chambers needs to out-point O'Neill on Monday to put his name forward. Especially with Dane Nielsen hurt. Update: Chambers was left out of the Storm squad Monday night... is he dropped or injured... we shall find out via Mr Mascord soon. Injured apparently... no mention of it in the Late Mail, Storm Twitter now saying he has 'hamstring tightness'. Qualifies as QLD's Merritt in that he's a seasoned pro - who would know his role if called on late. Form isn't great but when has that stopped QLD from picking a player before? B Slater, D Boyd, G Inglis, J Hodges/W Chambers, B Tate, J Thurston, C Cronk, M Scott, C Smith (c), D Shillington, S Thaiday, N Myles, A Harrison. Bench: C Parker, B Te'o, M Gillett, TBD... could be any one of J McGuire/J Lillyman/J Papalii/C McQueen/M Kennedy or if they play one less big man - D Cherry-Evans. SKINNY: Hannant's injury opens up a major chance for whoever is good enough for a spot on the bench... Will Chambers missing Round 10 probably put him behind Justin O'Neill to be Hodges' emergency backup with Dane Nielsen injured. The 'roll of the dice' option for QLD is to pick another fullback on the wing and move Tate to right centre (remember you read it here first). How did you rate the contenders in Round 10? Did we leave anyone out?